Where the Yard Arts Should Be Placed? Is the artwork going to be the main focus of the courtyard or be scattered along a row or path? Is your garden a pocket-sized space or a giant-sized estate? The size of the area or space that has been allocated for garden decorations helps to decide on the size which in turn helps to guess the location. If one is planning to garnish a big lawn then one must consider the over-sized garden spheres and then place those in the spot that can be visible from any corner of the space but will not hinder any activities that take place regularly on the grass. For the tighter zones, one can try out the small-scale creations tucked along the edge of the path, fence, or the flowerbed. For creating a more formal patio or a parterre, the one-of-a-kind sculptures can be placed in the front or centre of the space. This idea can be better suited for making a big and professional statement. How One Must Take Care of the Garden Statuettes? It is totally a personal decision but one must have a good idea about outdoor decorations. The accurate and loved pieces must be collected very carefully for placing the garden sculptures or simply accent the yard. If the outdoor space is used for meditation purpose or for doing prayers then the Buddha statues, carvings of angels or any other religious figures can be chosen. To bring out the fun and the quirky personality one can try placing the silly garden gnomes, fairies or the favorite animal-themed lawn ornaments in the semi-hidden spots. Every time a guest views those art objects, they will surely appreciate and give lots of complements. These welcomed distractions help in revealing your personal tastes and preferences in a manner that even the hardscapes and the vegetation can’t. To view a well-transitioned outdoor effect, one must go for the pieces that mirror the aspects of the interior decor. How One Should Care for the Garden Art? Depending on what material one selects for the yard art, there should not be any real maintenance. The art pieces are made to withstand the extreme climatic conditions. This depends on the material. For most of the part, an extreme pressure rinse with a mild soap is required to wash the pieces and helps them to get rid of any kind of dirt or the other buildups that can accumulate. If one has any lightweight pieces then it has to be made sure that the pieces are brought inside during the bad climatic conditions. 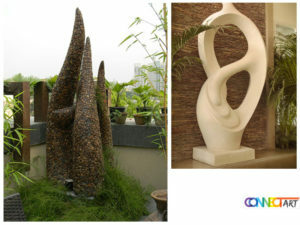 Getting in touch with the top Sculpture Manufacturer in Kolkata will make it possible to get the best sculptures for the outdoors.